during the Monster Energy NASCAR Cup Series Hollywood Casino 400 at Kansas Speedway on October 21, 2018 in Kansas City, Kansas. Since Chase Elliott claimed his first-career Monster Energy NASCAR Cup Series win 11 races ago at Watkins Glen (N.Y.) International, the driver has been on a roll. 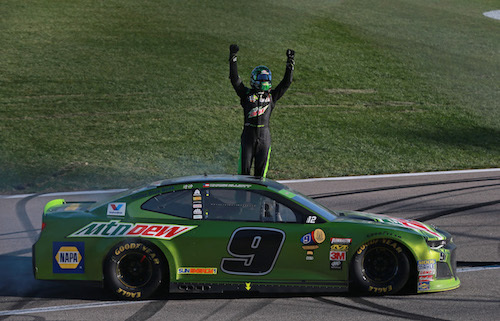 He claimed his third-career win, his second in the three-race round of the 2018 playoffs Sunday in the Hollywood Casino 400 at Kansas Speedway. Kyle Busch finished second. He challenged Elliott for the lead for several laps but, then, lost ground to Elliott as the 267-lap race neared its completion. Kyle Larson finished third but missed playoff advancement after starting the race in the back in a backup car because of a Friday practice crash. Other drivers eliminated from the playoffs at Kansas included Brad Keselowski, Ryan Blaney and Alex Bowman. All eliminated drivers finished the race in the top-10, though. 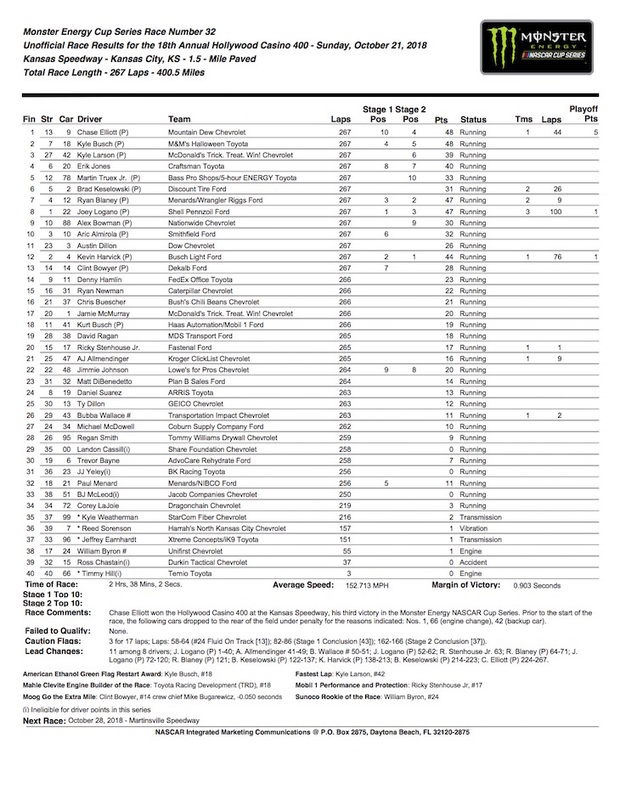 Joey Logano led a race-high 100 laps, all in the first half of the race. He won the first 80-lap stage of the race but was eighth at the checkered flag. The other stage winner was Kevin Harvick. Harvick beat Logano out of the pits during a cycle of green-flag pit stops past lap 120 and led 76 laps before a pit-road speeding penalty during another green-flag cycle past lap 200. Keselowski led laps during two green-flag cycles of stops by staying out longer, hoping for cautions that didn’t come. Each time, he lost ground on older tires. He recovered to finish the race in the sixth position. When Keselowski pitted for the final time on lap 223, Elliott took the lead he wouldn’t relinquish for the remaining distance of the race. The yellow flag waved only three times in the race. Aside from the two cautions at the end of each of the two 80-lap stages, the yellow flag only waved one other times — on lap 57 when William Byron blew his engine and spread fluid on the race track. Erik Jones and Martin Truex Jr. rounded out the top-five.